A PEASANT OF UPPER AUSTRIA. Home » A PEASANT OF UPPER AUSTRIA. 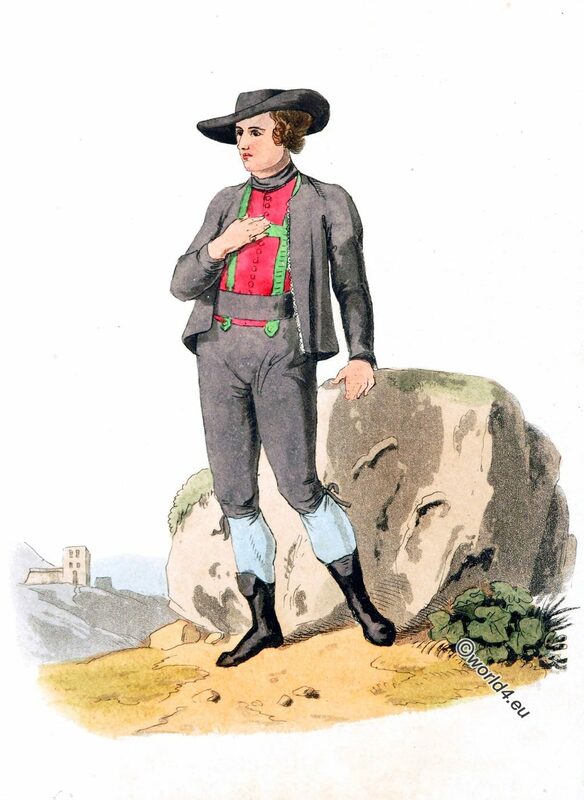 Peasant of upper Austria in traditional costume. The usual dress of the Austrian peasants. Austria, properly so called, independently of the duchies, counties, and bishoprics annexed to it is divided into Upper and Lower Austria by the river Ens, which falls into the Danube. Lower Austria is to the east of the Upper: Vienna is the capital of the former, and Linz of the latter. Austria exceeds all the other provinces of Germany in the fertility of its soil the abundance of its pastures, salubrity of climate, and beauty of the country. Corn, wine, and fruit are every where plentiful; the safron is superior to that of India. The manufactures of iron and steel the navigation of the great lakes and of the Danube, husbandry, the working of the mines and salt-pits, and a multitude of immense forests, furnish the different classes of the people with employment. The assistance needed by the poor and infirm is supplied by the numerous rich monasteries or ecclesiastical endowments throughout the country. The usual dress of the Austrian peasants is represented in this Plate. Their outer garment is a very short dark-gray jacket, which has clasps or loops, that are never used but in cold weather. Under this jacket they wear a red waistcoat still shorter, on which are metal buttons of a spherical form, and beneath the waistcoat they have braces of a green stuff, to which is fastened a collar of the same color, that falls over their shoulders. These braces are secured on the breast by a band of the same stuff, and at the ends by a large leather belt wrought with figures. Their breeches are made of black leather, and they wear buskins or half-boots that set very close. They wear round hats, shallow in the crown, but very broad in the brim. Source: Picturesque representations of the dress and manners of the Austrians by William Alexander. London 1813. This entry was posted in 1813, 19th Century, Austria and tagged Traditional Australian costumes on 10/1/18 by world4.